NAEM's 2015 EHS Management Forum Hector Rodriguez, Director, Global EHS & Sustainability; Biogen Inc.
Hector Rodriguez, Director, Global EHS & Sustainability, Biogen Inc.
Hector Rodriguez is the Senior Director of Global EHS & Sustainability at Biogen, a company that discovers, develops and delivers innovative therapies for the treatment of neurodegenerative diseases, hemophilia and autoimmune disorders to patients worldwide. 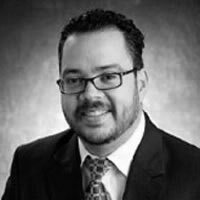 In his role Hector has company-wide responsibility for the development, implementation, and management of Sustainability and EHS strategies and programs. Hector is a professor at the University of Massachusetts where he teaches a course on business and sustainability and is a member of the Board of Directors at the American Board of Industrial Hygiene. Hector has advanced degrees in industrial engineering from New Jersey Institute of Technology and an MBA from the Stern School of Business in New York.